In an attempt to escape the gray post-New Years’s blues, I recently flew to Tucson, AZ to evaluate the wines of the southeastern part of the state between Willcox and Sonoita. These towns both have their own regional AVAs or American Viticultural Areas, and 75% of the wine grapes in Arizona come from vineyards planted in the Willcox region. Fortunately my friend and Sonoita resident Jay Bileti, a Board member of the American Wine Society, had compiled a curated list of the best wineries in both areas, and where I strayed from his list I encountered problems, but that only happened once. Jay is also a wine writer, and wrote a fine article on the early days of the Arizona wine industry, for ArizonaWinesandVines.com. The founder of the modern state wine industry was Gordon Dutt, a soil scientist hired by the University of Arizona to work on water quality issues for agriculture in 1970. The state was a big player in table grape production at the time, and a grant from the state to plant grape in the Four Corners area in 1976 brought promising results from the Arizona quadrant that Dutt oversaw. The first AZ wineries were founded in the early 1980s, including Dutt’s own Sonoita Vineyards, which his granddaughter currently runs while also impressively raising small children. Unfortunately, I arrived just as the big storm which brought deadly mudslides to California was passing through, and I didn’t see much blue sky for a few days. 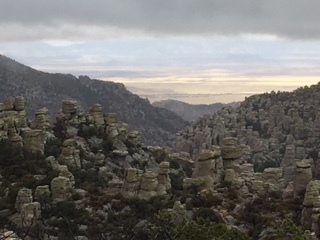 I drove some 35 miles south to the Chiricahua National Monument which helped make the journey worthwhile. “Um, is this ‘Ventura Highway’ yet?” In search of bright, sunny AZ. This impressive national park of almost 12,000 acres has weathered rhyolite pillars and other formations resembling balance rocks to pipe organs, and the road that winds through the canyon starts far below the cliff formations but eventually rises to 7,310 feet. I reached the summit just as a sleet storm with wind gusts of 35-40 mph reduced the temperature to near zero. I took enough pictures, gritting through my teeth in the blast, to have made the trip, and maybe the journey, worthwhile. Willcox claims to have been then cattle capital of the West in 1886. Returning there, I stopped at the town’s historic district hosting stores from the tacky to the upscale, and visited two tasting rooms there; Keeling Shaeffer and Flying Leap Vineyards. I found that wineries in both Willcox and Sonoita regions have found that Mediterranean varieties will produce high-quality wines in the southeast of the state. What I like about what they’re doing is that they mix it up, blending grapes from Spain, southern France and Italy with very impressive results. The Rhone varieties are strong, from Viognier and Syrah in the north to Grenache, Picpoul and Mourvedre in the south. In addition to Tempranillo, the foundational grape of Spain, AZ wineries are also using Graciano, a tiny spice element in Rioja but used in major proportions in Willcox and Sonoita, to excellent effect. The K-S Picpoul 2016 was impressively prototypical, with subtle, flinty aromatics, like a blend of pinot grigio and sauvignon blanc meant for a hot climate; crisp and lively on the palate. *½ The K-S “Two Reds” Grenache 2014 (5% Syrah): Nose, lively Rhone-style aromas: dried cherries, white pepper and baking spices, impressive start. On the palate, the wine is vibrant, with spicy plum and red cherry flavors and zesty mineral and integrated tannin notes, and a vibrant clean finish; very stylish and Rhone-like. √ K-S Farmer’s Mourvedre 2013 Nose: subtle but elegant, like Tannat with smoky black cherry, clean earth notes. On the palate, much like the “Two Reds”, light but very zesty. *K-S Partner’s Rhone Blend (GSM) 2013: Nose: very Rhone-like, smoky plum and cherry, white pepper and baking spices with vibrant fruit character. Palate: medium bodied but vibrant, bright acidity and focused, well-integrated fruit. ** K-S Three Sisters Syrah 2014: Nose complex, dried candied cherry, baking spices and pepper. Palate: dense yet lively, lots of dense fruit and spice with medium-plus tannins, lively fruit and acid balance on the finish. Much more multi-dimensional than most syrahs. *K-S Mourvedre 2013 “Schaeffer Boys”: Oak aging gives more spice, complexity than their regular mourvedre. Nose is rich, with oak, dried fruits and clove. Palate is rich and complex with lots of spice and earth notes with dried fruits. *Keeling Brothers Shiraz 2014: Using the Australian shiraz clone makes a huge difference even in the same vineyard. The nose is typical of an Aussie style: American oak and rich black spicy plum. On the palate, large volume but well-balanced oak, black fruits and tannin with a long spicy finish; a classic Aussie style. ***K-S Home Place Reserve Syrah 2015: This is a late harvest wine and at 15% alc. is a sipping and not a quaffing wine. Still, it’s just brilliant, for those who like richness and finesse at the same time. The nose is rich, with black cherry and baking spices and lots of mocha! On the palate, rich and smooth, plush as velvet with syrah flavors, dried red and black fruits with mocha, rich smooth tannins, and a long smooth finish. The empty glass also has blueberry aromas. Next was Flying Leap Vineyards’ tasting room at the corner of the historic downtown, although their vineyards are actually in the Sonoita region. √Tannat 2015: color a medium garnet which is a bit light for this grape. Nose: subtle, with nice clean earth hints and black cherry notes. Palate: clean red/black cherry notes with chewy tannins and a long finish with pepper notes; stylish. 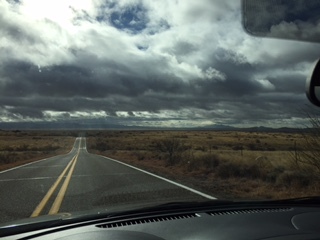 Leaving Willcox, I drove west on I-10 for a few miles, then took exit #331 and drove south on Rt. 191 to visit Golden Rule Vineyards on the road of that name, after one of the local mines. The owners, Jim and Ruth, are farmers who grow pistachios, but the trees only bear a crop every other year so they decided to diversify by planting grapevines and now they have 1000 trees and 1000 grapevines (26 acres of 9 red varieties). Like most other SE AZ wineries, Golden Rule grows a variety of Mediterranean varieties, but is pulling out their zinfandel; in late summer southeast AZ gets monsoons, and the thin-skinned zinfandel often has broken skin and rot issues from the sudden rains. For farmers who started growing grapevines to diversify in specialty crops, Golden Rule Vineyards are doing an impressive job of consistent quality and terroir-driven winemaking. Like Keeling-Schaeffer and Flying Leap, I found a consistency in their wines, from subtle but varietally-correct aromas to taut, vibrant fruit on the mid-palate and brilliant, clean acidity on the finish. *Sangiovese 2013: Nose, clean and fresh with bright red cherry fruit. Palate: dry, zesty red cherry with spice; excellent varietal character. **Commonwealth 2012 (85% Syrah, 15% Petite Sirah): Nose, mature and elegantly poised between clean earth syrah notes and spicy, mellow fruit as with a Chateauneuf-du-Pape. Nuanced, smooth and mellow but lively, with a fresh finish. A great value for $18 compared to CDN at like twice the price. Eureka 2013 (Cabernet Sauvignon, Sangiovese, Petit Sirah, Cabernet Franc, Petit Verdot). Nose: fun, zesty, fruity, like a Super Tuscan. Palate: spicy, Sangio-driven but rich anise-flavored black fruits on the finish. Sign up to be notified automatically when a new article goes up.